A few months ago at a Buffalo Trace tasting we saw a fellow Bourbon Sipper, John Cuni do something incredible. Many bourbon lovers get to the end of a bottle and either let it sit because they don’t want to kill a great bottle, or they end up adding a good bourbon to an infinity bottle. We will share our thoughts on when it makes sense to vat and when you’re just wasting bourbon, but that’s an article for another day. 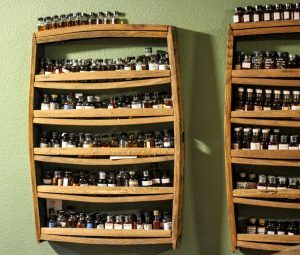 In order to make his bottles live on, the first thing he does when he opens a new bottle is to pour a 2oz sample and put it on his sample shelf. We have all filled samples at one point or another, but making the process consistent turns into something beautiful. He had a shelf full of sample bottles which he could go to down the road after a bottle was long gone. Though filling bourbon sample bottles when you first crack a bottle may be a simple idea, implementing it is all the difference. We encourage you to fill bourbon sample bottles habitually as you open new bottles moving forward, you’ll thank us later. Here are a few tips for filling bourbon sample bottles. This is great for doing side-by-side tastings long after your bottle is gone when you’re curious to try one of your current bottles against one you remember being great. 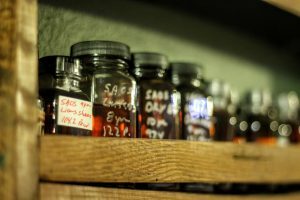 Share any hacks you have for bourbon and bourbon samples.